Product prices and availability are accurate as of 2019-04-21 07:48:49 UTC and are subject to change. Any price and availability information displayed on http://www.amazon.com/ at the time of purchase will apply to the purchase of this product. If you're a parent, the fear of your little one running away once you've turned your head away and getting lost is very, very real. We understand the stress that it brings, and that's why we've designed the Child Anti-Lost Wrist Link to give you the ultimate peace of mind. 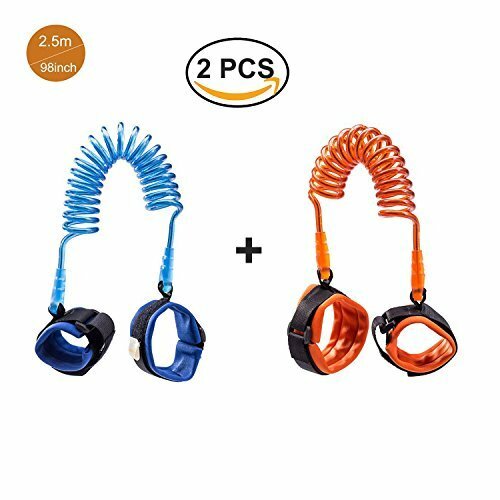 With adjustable straps, secure double-velcro that your little one won't be able to remove on their own, and sturdiness that lasts through the tug wars and outbursts of energy, this wrist link is a cut above the rest, and is the must-have when bringing your young one out to crowded places, mall and park. Age Range: 2 years old and over. PEACE OF MIND:The child safety wristband will give you peace of mind by keeping toddlers close while still allowing them a bit of independence. The baby harness consists of a [2 Pack] harness set: 8.2ft orange and 8.2ft Blue COMFORTABLE & SAFE: The wrist strap is designed with superior cotton for enhanced breathability, and has high flexibility that makes it suitable for young wearers. Comes with adjustable wrist straps that fit snugly on adults and kids EASY TO USE:one cuff of this baby-soft harness connects to the adult wrist and the other connects to the child's wrist. For extra comfort, you can adjust the toddler's wrist strap and the adult wrist strap. In this fashion, the harness is a one-size-fits-all proposition! GREAT FOR:Walks in the Park, shopping centers when you just can't carry your baby any longer. You can strap your end to your wrist, backpack, Shopping Cart, Even Baby Strollers NOTE:Parents should keep following the kids closely to avoid the pull making kids lose balance and fall. 2 Anti-lost links in one package: 2.5 metres of blue and 2.5 metres of orange.